Life on the water doesn’t get any better than at Sunset Grille and Raw Bar. 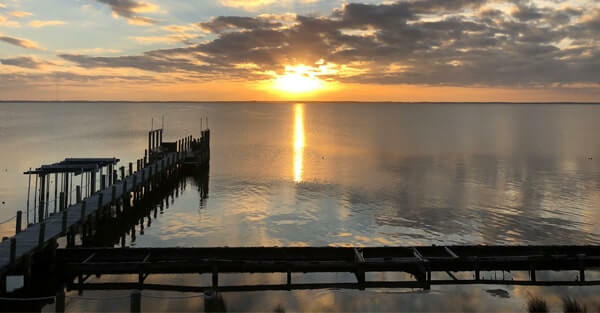 With a large waterfront deck and dining area and plenty of indoor seating, every seat in the house has a fabulous view of the mesmerizing and beautiful Currituck Sound. Whether you enjoy your meal and tropical cocktail as you sit among the palm trees, or hang out by one of the tiki and sushi bars, you are sure to become immersed in Carribean flair as you enjoy Sunset’s fresh local seafood, steaks, pasta and more. Don’t forget to check out Sunset Watersports on the Gazebo to schedule a sunset cruise or other water adventure. Duck. Watch the waves roll in off the Atlantic while you relax in a fun family atmosphere and enjoy great cuisine at The Oceanfront Grille. 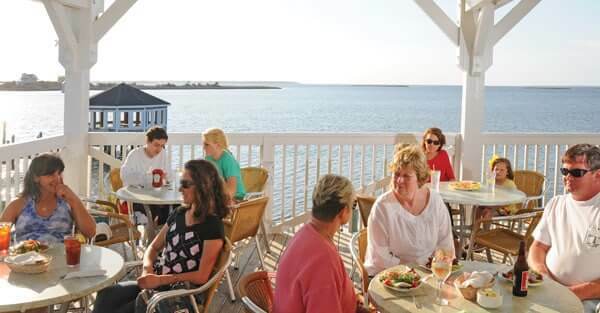 As the only oceanfront restaurant on the Currituck Outer Banks, The Oceanfront Grille offers a unique menu that pairs dinner entrees so you can sample generous portions of more than one of its tasty menu items. The only thing you’ll need to bring is a jacket for those cool ocean breezes. 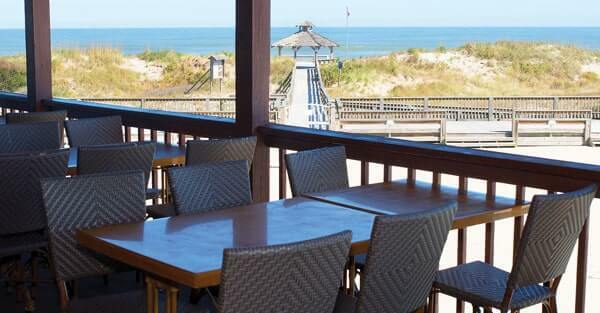 The Oceanfront Grille at the Corolla Light Resort will take care of the rest – even the view. Corolla. 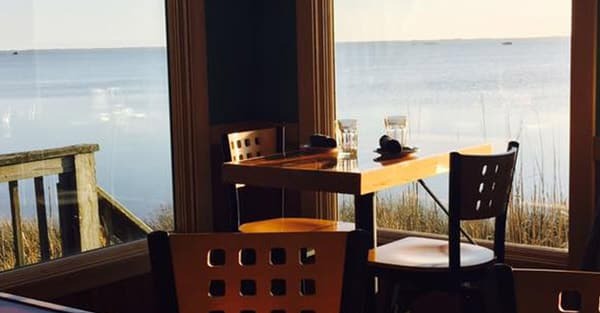 Soak up the tranquility of the Currituck Sound at Paper Canoe, a stunning Duck waterfront restaurant that features oversized windows to give guests a front row seat to the natural beauty around them. 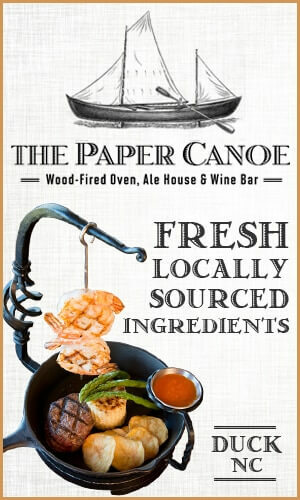 Warmly lit with natural light flowing in off the water, Paper Canoe offers a menu of fresh food prepared simply and with passion using ingredients from our own backyard. Choose from handmade pasta, locally caught, seafood, and rustic wood oven specialties that change daily and enjoy as you relax sound side at Paper Canoe. Duck. The Village Table & Tavern is Duck’s newest casual waterfront dining destination. From the team behind TRIO in Kitty Hawk, The Village Table & Tavern offers a fresh take on southern classics with a coastal Mediterranean flair. We have something for everyone to enjoy, from inspired sandwich combinations to elegantly prepared local seafood with a kick of creativity. In addition to our approachable menu for all ages, we serve local and international craft beers, an exceptional selection of wines, and craft cocktails that will leave you wanting more. Duck. Perfectly situated along the Beach Road overlooking the majestic Atlantic Ocean, the Rundown Café offers delicious cuisine with an eclectic fusion of Pacific Rim and Caribbean flair. Head upstairs to the Tsunami Bar to get into the spirit of the islands, and take in the view at this classic surf bar. Gaze out at the sea, or step outside onto the Ocean View Hula Deck to feel that fresh ocean breeze and breathe in the salt air. Enjoy a refreshing tropical elixir or draft beer, check out the surf conditions, kick back and relax and experience island life at the Rundown Café. Kitty Hawk. At Black Pelican Seafood Company, guests love the panoramic view of the Atlantic Ocean along with the delightful ocean breezes at the second-story dining room and deck overlooking the sand dunes. 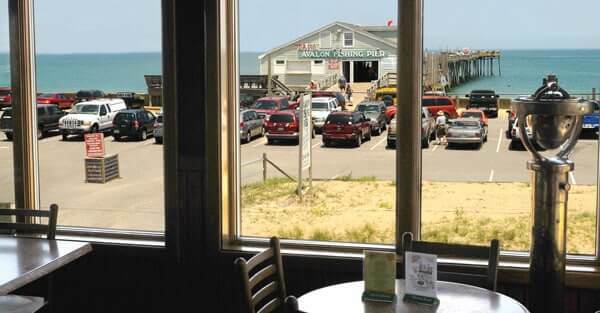 Located in the U.S. Lifesaving Station (built in 1874), the Black Pelican offers a menu that is sure to have something for everyone. Try a personal sized pizza straight from a wood-fired oven, or their delicious steak and fresh seafood steamed to perfection, and don’t forget their scrumptious homemade desserts. Enjoy a relaxed atmosphere, great food, and a view that can’t be beat. Kitty Hawk. Featuring the best seafood around, Awful Arthur’s Oyster Bar is the Outer Banks’ only authentic oyster bar and is a favorite among locals and visitors alike. 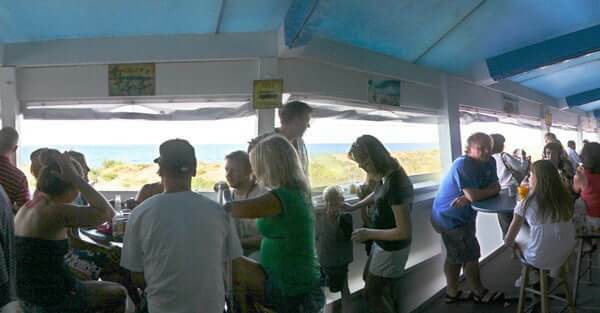 Voted one of the top oyster bars in the nation by Coastal Living magazine, this fixture on the Outer Banks restaurant scene is known not only for its famous oysters, but all its fresh seafood that guests can watch being steamed right in front of them. Menu favorites also include scrumptious burgers, homemade pastas and delicious sandwiches. 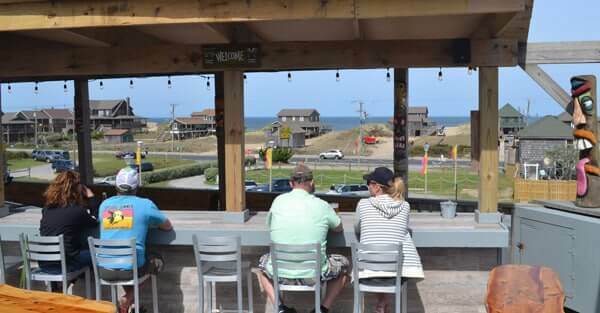 At Awful Arthur’s, you will love being able to kick back and relax in one of the only ocean view lounges on the Outer Banks and take in the amazing view, food, and service. It’s the perfect spot to sit back and enjoy a drink or cold beer. Kill Devil Hills. Enjoy the finest in Carolina-style cooking as you relax next to the ocean and watch the waves roll in. 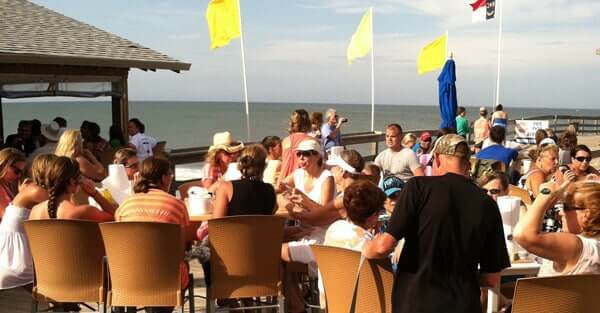 From sun up to sun down, you can grab a bite to eat at Nags Head Pier while taking in the unrivaled sights. If you prefer to dine outside, you’ll love Capt. Andy’s Oceanfront Tiki Bar & Grill where you can relax in the sun with a frosty beer, glass of wine, margarita, or frozen drink. If you prefer to stay in the shade but still enjoy the delightful ocean breeze, Capt. Andy’s has you covered. Before you leave, don’t forget to take a stroll down the pier to soak in the salt air and stunning blue Atlantic as you take it in from high above. Live music every night with more than 30 beers on tap and a full ABC license. Known for the “Best Burger on the Beach” for years, Mulligan’s is quickly gaining a reputation for the best local seafood as well. 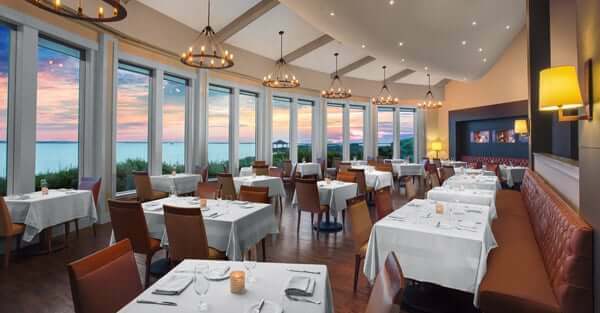 Put that together with outdoor seating that surrounds over half of the building with amazing views of the ocean, Historic Cottage Row, and sunsets over Jockey’s Ridge State Park, and you have the makings of a tremendous dining experience. Mulligan’s now has “Doggie Dining” available on the Tiki Deck as well as in the downstairs Garden Deck so there are plenty of seats for our furry friends to also dine with a view. Add an Orange Crush to all of that, sit back, relax and enjoy! Nags Head. 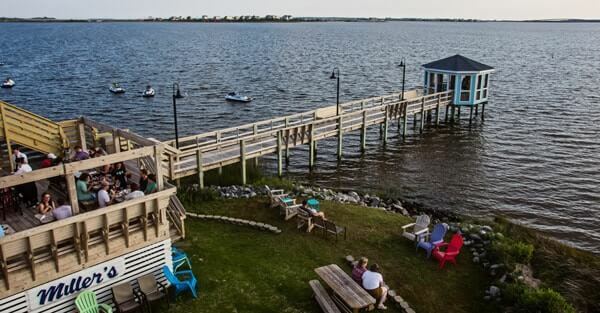 Natural beauty, local lore, and delicious authentic cuisine all come together at Pamlico Jack’s Restaurant & Bar. Enjoy your meal overlooking the Roanoke Sound from the outdoor bar that is an authentically replicated pirate ship, complete with sails and rigging. An open-air sound front deck offers spectacular views of the sun as it disappears into the waters of the Roanoke. Guests during the season can enjoy live entertainment nightly. Indulge in Gulf Stream seafood, steaks, homemade pasta, or a lighter fare and a glass of wine, microbrew, or custom cocktail. Nags Head. At Miller’s Waterfront Restaurant, you have plenty of options when it comes to where you want to enjoy your meal. 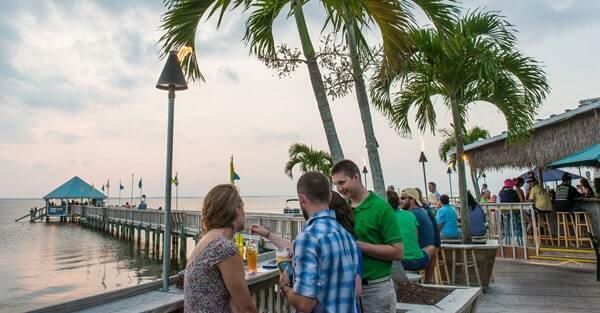 Located on the beautiful Roanoke Sound, the view is always breathtaking – whether you choose to eat inside or outside at the Waterfront Sunset Bar & Grill. Our popular menu features favorite seafood dishes such as fresh North Carolina flounder topped with jumbo lump crabmeat, traditional friend shrimp and oysters served with our famous tartar sauce. Upstairs in our beautiful open-air setting, the Waterfront menu offers smaller plates to share. No matter where you dine at Miller’s Waterfront Restaurant, you’ll always enjoy spectacular views right from your seat at any time of day. Nags Head. Sugar Creek is famous not only for its great local shrimp, incredible prime rib and native crab cakes. It’s also revered for its location on the beautiful Roanoke Sound. There are not too many restaurants that sit out over the water like Sugar Creek does, where guests are treated to amazing views of waterfowl, wildlife, and breathtaking sunsets. With plenty of indoor and outdoor waterfront dining options, coupled with walkways, a gazebo and pier for a more intimate experience with nature, Sugar Creek is a favorite among locals and visitors alike. Nags Head. 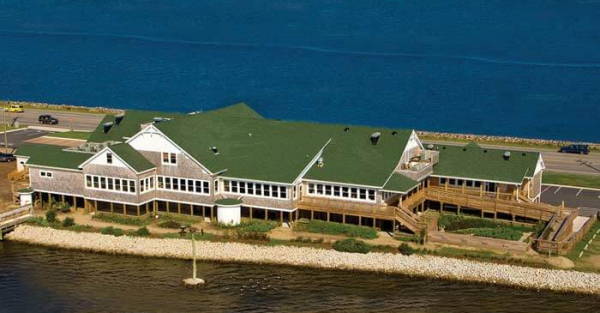 a panoramic view of the beautiful Roanoke Sound and its untouched marshlands as you dine on the bounties of local waters. Almost every table offers a view of the water and guests love having a front row seat to the resident osprey, shorebirds, stunning sunsets, and tranquil waters. Before you dine, tour the Lone Cedar Café’s open gardens along the water where greens, vegetables, and herbs are grown chemical free. With deep roots in the local fishing industry, Basnight’s Lone Cedar Café continues the tradition today by serving the best local seafood, caught and delivered to its door daily. Nags Head. 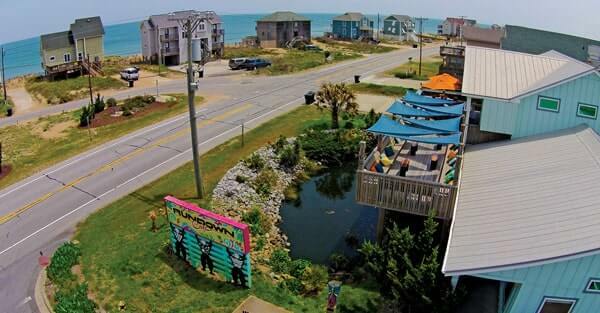 Fish Head’s Bar & Grill is considered the premier tiki bar of the Outer Banks. 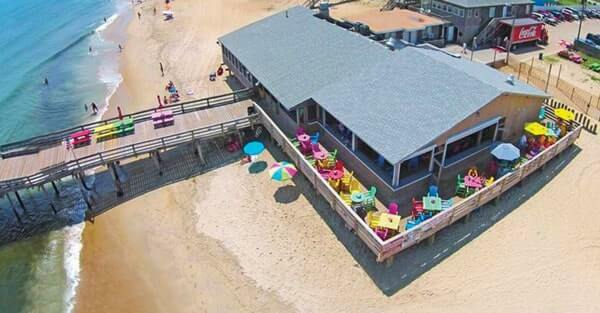 The bar and grill is located on the Outer Banks Fishing Pier, making it the perfect spot for enjoying great food and drink right on the oceanfront. Whether you want to enjoy the sunrise with a delicious breakfast sandwich or watch cotton candy colored skies as the sun sets behind you, the view at Fish Heads is second to none. Shrimp Happy Hour (15-cent shrimp) is held from 4 to 6 p.m. daily. Fish Heads features live music seven nights a week in-season, has more than 30 beers on tap and offers a wide selection of wine. Local favorites include their delicious fish tacos, conch fritters, homemade crab cakes, and tuna salad just to name a few. You’ll love the food and the view at Fish Heads Bar & Grill. Nags Head.